Selecting environmentally preferable materials is an important part of the green building process. Increasing numbers of Green Building Conferences, Expo's and suppliers are making it easier and easier to find these materials and their suppliers. In the end, all the green strategies you choose will be fulfilled through your use of materials and resources…wood, glass, metal, fibers, adhesives, etc. An essential part of making your project green, therefore, comes from your understanding of where those materials and resources came from, how they were obtained and processed and transported and, in the end, how they will be disposed of. While this aspect of building green will seem like overly specialized knowledge, by becoming acquainted with the LEED standards for materials and resources you can gain a good introduction to this subject. Know, too, that the market in environmentally sound materials (including recycled or ready-for-reuse) is growing rapidly, providing consumers with more and more choices on a regular basis. LEED begins its materials and resources section with a requirement for your completed building--that it contain an easily accessible area that serves the entire building for the collection and storage of non-hazardous materials for recycling including, at a minimum, paper, cardboard, glass, plastics and metals--so that your new building ensures that its users will recycle at a high rate. LEED also encourages you to consider whether there are existing structures on your site that you can re-use for your new building. The intent here is to extend the life-cycle of existing building stock, conserve resources, preserve cultural resources, reduce waste and reduce the environmental impacts of new buildings as they relate to materials manufacturing and transport. (This kind of thinking applies also to additions that are no more than twice the size of the original building.) 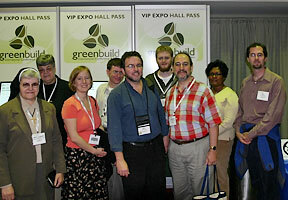 LEED grants points based on how much of the original building--its walls, floors, roof, etc.--you are able to re-use. During construction, LEED encourages you to divert as much of the construction, demolition and land-clearing debris as possible from disposal in landfills and incinerators. LEED awards points for projects that re-capture recyclable materials for re-use in the manufacturing process and that redirect reusable materials to appropriate new uses. This will require leadership on your part as owner, as well as a commitment from your contractor and sub-contractors. There are an increasing number of businesses collecting and using such materials, and often you can reduce waste hauling fees associated with your project by recycling your construction-related waste. Ask your contractor or your area’s USGBC Chapter for a referral. Using salvaged, refurbished or reused materials that can reduce the demand for virgin products while also reducing waste. Here again an entire new industry supplying such materials is growing rapidly. Talk to your architect, contractor or USGBC Chapter. Using materials that contain a significant degree of both post-consumer and pre-consumer recycled content. Using materials produced in your region, which supports the use of local resources and reduces the environmental impact of transportation. Using rapidly renewable materials (harvestable in ten years or less), such as bamboo, cork, cotton insulation, wool, agrifiber, linoleum, wheat board or strawboard, or wood certified by the Forest Stewardship Council to help promote environmentally responsible forest management.